What Resources Does the Georgia CTSA Have for Department of Medicine Faculty? The Georgia Clinical and Translational Science Alliance (CTSA) of Emory University, and partners Morehouse School of Medicine and Georgia Institute of Technology, is one of a national consortium striving to improve the way biomedical research is conducted across the country. The consortium, funded through the NIH’s Clinical and Translational Science Awards (CTSA), shares a common vision to translate laboratory discoveries into treatments for patients, engage communities in clinical research efforts, and train the next generation of clinical investigators. To fortify and accelerate the process of bringing scientific discoveries to patients, the ACTSI supports programs aimed at liberating the talents of clinical and translational investigators by providing infrastructure, regulatory support, funding, and better access to analytical tools, education, and training. For investigators, this translates into reduced barriers and the development of multidisciplinary collaborations within research centers. For the community, this means improved diagnosis and treatments. Visit www.actsi.org and click on ‘Submit a Request’ in the top right corner of the homepage to begin. 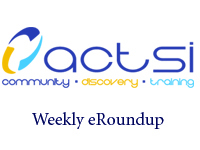 If you would like to receive the ACTSI weekly e-newsletter, which includes clinical and translational science news, funding announcements, events, resources, and educational opportunities, please send an email to actsi@emory.edu.